Two superconductors coupled by a weak link support an equilibrium Josephson electrical current that depends on the phase difference ϕ between the superconducting condensates. Yet, when a temperature gradient is imposed across the junction, the Josephson effect manifests itself through a coherent component of the heat current that flows opposite to the thermal gradient for |ϕ| < π/2. The direction of both the Josephson charge and heat currents can be inverted by adding a π shift to ϕ. In the static electrical case, this effect has been obtained in a few systems, for example via a ferromagnetic coupling or a non-equilibrium distribution in the weak link. These structures opened new possibilities for superconducting quantum logic and ultralow-power superconducting computers. In the paper by Antonio Fornieri (former PhD student of Laboratorio NEST, Scuola Normale Superiore) and co-authors, a group coordinated by Francesco Giazotto from Istituto Nanoscienze CNR@NEST has demonstrated on Nature Nanotechnology journal the first experimental realization of a thermal Josephson junction whose phase bias can be controlled from 0 to π . This is obtained thanks to a superconducting quantum interferometer that allows full control of the direction of the coherent energy transfer through the junction10. 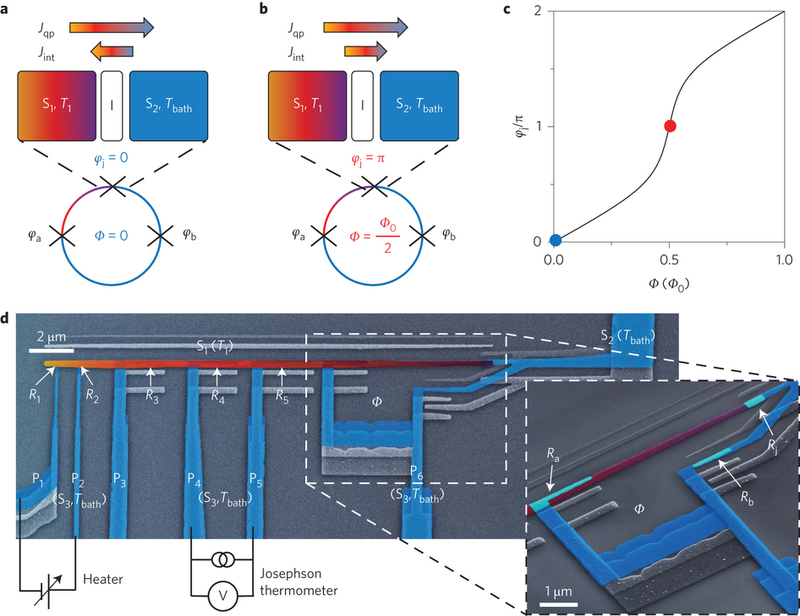 This possibility, in conjunction with the completely superconducting nature of our system, provides temperature modulations with an unprecedented amplitude of ∼100 mK and transfer coefficients exceeding 1 K per flux quantum at 25 mK. 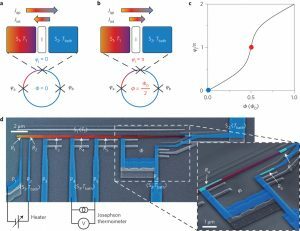 This quantum structure represents a fundamental step towards the realization of caloritronic logic components such as thermal transistors, switches and memory devices. These elements, combined with heat interferometers and diodes, would complete the thermal conversion of the most important phase-coherent electronic devices and benefit cryogenic microcircuits requiring energy management, such as quantum computing architectures and radiation sensors. More experimental details can be found at this LINK.